The digital spaces work this week was incredibly interesting. Building my map was a fascinating exercise. As someone who has made regular use of Prensky’s “immigrant/native” metaphor, I found White’s rethinking of the differences between people’s’ internet use far more nuanced. In that it more accurately describes the various ways people use the internet by identifying multiple types and contexts for online interactions, it is ultimately a more helpful metaphor as well. White’s metaphor succeeds through his identification of a continuum of use, which takes the way we talk about online usage out of the realms of generational differences and binary oppositions. And while it might not completely remove notions of identity based on internet use, the visitor/resident metaphor does allow us to think about online identities without the freighted connotations that terms like “immigrant” and “native” carry. Describing a continuum of use between the poles of “visitor” and “resident” presents internet usage in terms of dynamic, frictionless, and intentional participation anywhere along that continuum according to a user’s needs or desires in a given moment. Taking it two-dimensional by adding the “personal/institutional” axis ensures that practically anyone can positively locate themselves in this metaphor. I love maps. I love maps of all kinds. Ancient maps. Atlases. Globes. Curriculum maps. Mind maps. And now I have a new one to pour over, the digital spaces map. This map allowed me to visualize my own cyber contexts, the online tools I use, and the places on the internet where I reside and visit. And while raising a slight challenge above to notions of identity, this exercise has revealed, in no uncertain terms, aspects of my identity. I was quite surprised by the extent to which I “live” as a resident of the internet. As I set out to draft my map, I predicted it to be weighted far more on the visitor side given the hallmark of our visitor-like actions not leaving traces or “footprints” of our having been online. But it would appear that I leave a few more “tracks” in the cyber-sand than I originally imagined. For having been born into the old country of Analog, it would appear I have readily embraced my adopted country of The Internet. At this point, I would view the first pass at my online usage map as a draft. (In part, because I would like to create one that is not as “old school” as this is with its paper, Sharpies, and colored pencils.) In a second draft I’d likely slide everything on the “resident” side a bit more towards the center. While I am decidedly more resident than I initially suspected, I’m not that far to the right. Some of the positioning was due to needing to fit everything on the page such that it could all be seen. I would also like to find a place for search, as White discussed in the video of his own map. I think it would be a very interesting exercise to do as a reflective exercise with a faculty and to do repeatedly over time. What an interesting tool for reflection: How does my online use change over time? Does that change mark some kind of evolution? How does my online presence map onto phases in my life? In my instructional practices? 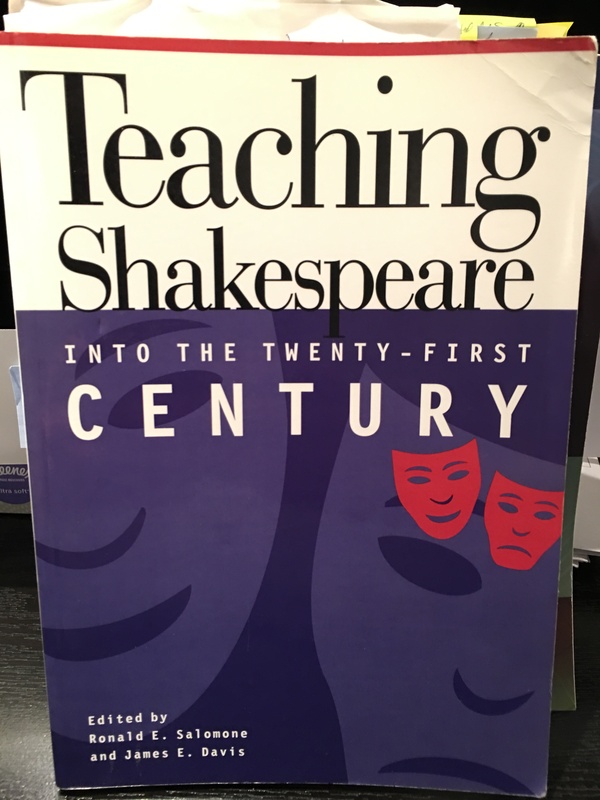 What might it suggest for my professional development? My role as a coach? How might de-compartmentalization streamline my online presence? Is de-compartmentalization desirable? 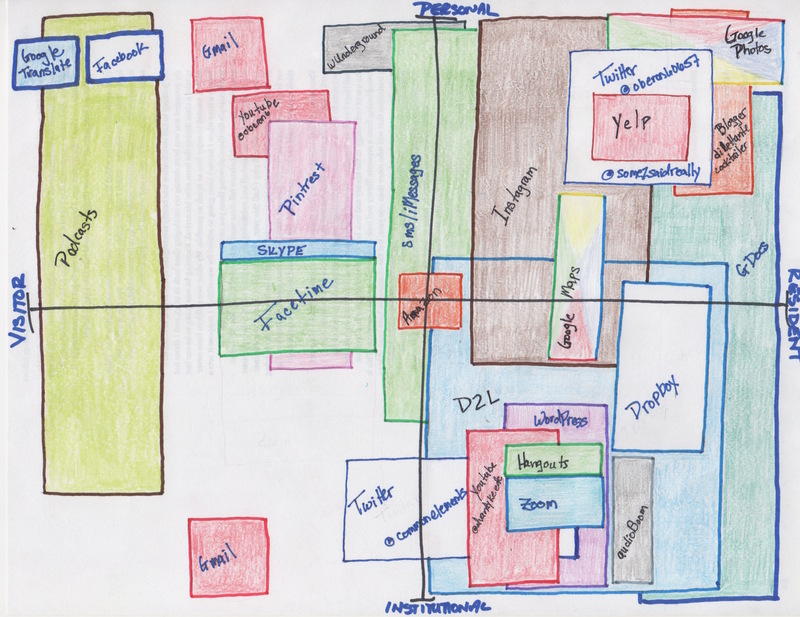 In what areas might compartmentalization benefit my online experiences? How would I use this with my students and to what ends? Etc. Again, this week’s assignments have been mind-blowers in multiple ways. My thoughts over the past few days keep returning to how in a couple short decades digital technology has so utterly transformed our world. That realization makes the work of getting our students learning digitally and acting in terms of digital and global citizenship seem more important than ever. All from a simple map? Yeah, all from a simple map.